In a previous blog post (Implementing Directory Synchronization) I already explained how to implement Directory Synchronization so our lab environment is already up-and-running, and health when it comes to the on-premises Active Directory and Directory Synchronization. If you’re running Exchange 2010 make sure that your Exchange 2010 are fully updated with Service Pack and (preferably) Update Rollup 10. 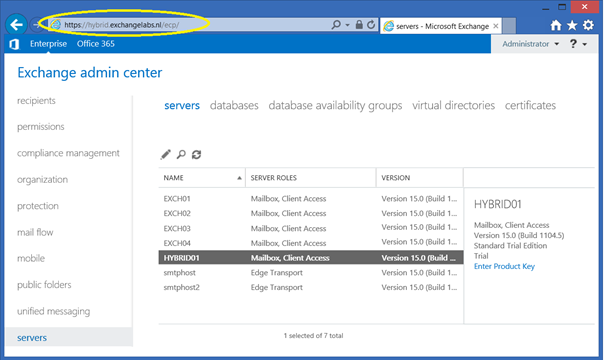 If you’re running Exchange 2013 on-premises make sure that you have deployed Exchange 2013 CU9 in your environment. Please be aware that Microsoft only supports the latest version of Exchange 2013 in a hybrid environment! It happens every now and then that I working with a customer that’s using some Terminal Server solution to offer external access for employees and they’ve not deployed Outlook Anywhere on the Internet (and thus are not using Autodiscover externally). For using Exchange Online and a hybrid environment this is an absolute showstopper. Autodiscover is needed for Exchange Online, but it is also needed in a hybrid environment for discovering mailboxes in your on-premises Exchange environment. Without Autodiscover it’s not possible to implement a hybrid environment. Outlook Anywhere needs to be configured and externally available as well, since Outlook Anywhere is used to provide free/busy information, especially when using cross-premises availability services. I ran into this last year (end of 2014) where a customer had disabled Outlook Anywhere on a user level. Cross-premises free/busy information was working fine for regular users, but users that had Outlook Anywhere disabled (on-premises) free/busy was not working (please check this Disabled Outlook Anywhere causing free/busy issues blog for more information). So, when all prerequisites are met, it’s time to start working on the Exchange 2013 Hybrid server. As explained earlier, the hybrid server is the server where the Hybrid Configuration Wizard is run. The hybrid server can be a regular Exchange 2013 server that’s already available in your on-premises Exchange 2013 environment, or it can be a new Exchange 2013 server. This new server should be the same version of the other Exchange 2013 servers of course, and they have to be at the current Cumulative Update level. In our example we’re going to install a dedicated hybrid server, configured with its own FQDN (hybrid.exchangelabs.nl). This FQDN will be used later on in the project for SMTP traffic between Exchange on-premises and Exchange Online and for migration traffic when moving Mailboxes between Exchange Online and Exchange On-Premises. When it comes to configuring this hybrid server, all Virtual Directories are configured with the values one would use for the regular Exchange servers, like https://webmail.contoso.com/owa for OWA or https://webmail.contoso.com/ews/exchange.asmx for the Exchange web services. This way you can prevent unwanted results being returned by Autodiscover requests. For redundancy purposes it’s best to have multiple Exchange 2013 Hybrid servers to distribute the load across these servers and to continue working when one server fails. You can use a (hardware) load balancer for this, but a better solution is to use multiple, single server, each with their own FQDN. In this case each server is externally accessible, independent of each other. What’s the use of this compared to a load balancer? Once you start moving Mailboxes from Exchange 2013 on-premises to Exchange Online you have to define so called ‘endpoints’ in your on-premises environment. These endpoints are used by Exchange Online to access the Mailbox Replication Service (MRS) proxy running on your on-premises Exchange servers. With multiple FQDNs you can create multiple endpoints and spread the migration load this way. This will give a better result than when distribution move requests using a load balancer (strangely enough). The good news is, you can use a wildcard certificate for this (even for the SMTP service) so there’s no need to purchase separate SSL certificates for each hybrid server. It is possible to publish the Exchange hybrid servers using TMG (although I’m not a big fan of this) and personally I would not recommend following this path because of ending support for TMG, but the article How to Configure TMG for Office 365 (Exchange) Hybrid deployments provides a step-by-step approach on how to achieve this. Please note that this article is based on Exchange 2010. 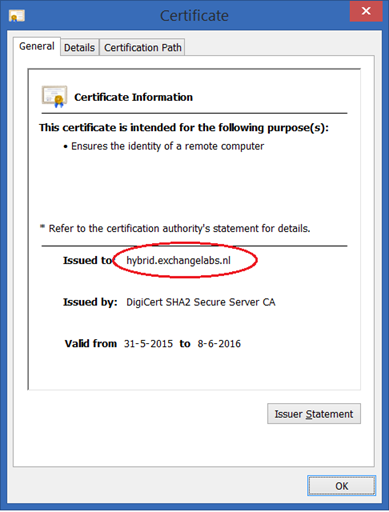 How do you test the Exchange 2013 Hybrid server? The easiest way is to logon to the Exchange Admin Center (http://hybrid.contoso.com/ecp) and see if you can manage your Exchange environment. To test the Transport Service on the Exchange 2013 Hybrid server you can use the MX toolbox on the Internet, which you can find at http://mxtoolbox.com/diagnostic.aspx. Enter the FQDN of your Exchange 2013 Hybrid Server in the Mail Server textbox and click the Test Email Server button. Please remember that for all other traffic the normal FQDNs and thus servers via webmail.contoso.com and autodiscover.contoso.com are used, also for communication between Exchange on-premises and Exchange Online. So, this is a good time to add (and validate) your additional domains in Office 365. 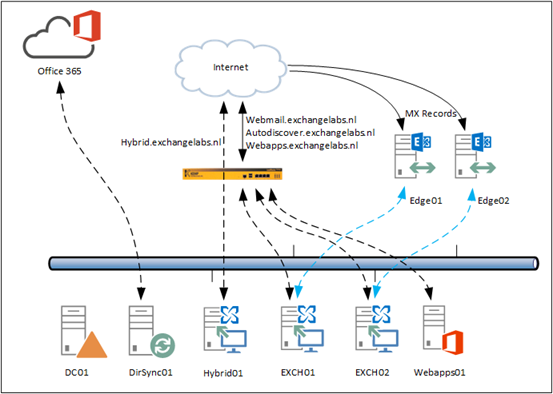 In this blogpost I explained a bit more about an Exchange Hybrid scenario, where your on-premises Exchange environment (2010 or 2013) is integrated in Exchange Online through the use of one (or more) Exchange 2013 Hybrid servers. There are a few prerequisites to be met, but if all is configured properly it’s time to continue with creating the actual Exchange Hybrid configuration, as explained in the next blog post. Hi Jaap, one question regarding Outlooky Anywhere. You mean explizit the client side (Outlook itself), right? No, I’m afraid not. I mean the Outlook Anywhere service on the Exchange servers themselves. You have to configure Outlook Anywhere on the Exchange servers and have it available on the Internet. It’s my understanding that using hybrid.domain.com to seperate hybrid traffic is prefered, however in simple deployments, if certificates are valid, using the regalur names (ex. webmail.domain.com) pose no problem, or do I miss something? You’re right, you can use the regular Exchange servers for this, but I typically recommend using a dedicated Hybrid server. Thank you, excellent post. Question about the reverse proxy, if we have a TMG in place with Exchange 2010 and want to continue using with Exchange hybrid (duly noted your recommendations to not use it and agree with 🙂 ). Do we need to change the publishing rules to include Exchange 2013 hybrid servers? Trying to understand what changes do we need on reverse proxy if we introduce Exchange 2013 hybrid servers in Exchange 2010 org. sorry, one last question. Can NLB be used for load balancing the hybrid servers ? Thank you sir for the quick replies and all the awesome posts, appreciate it. I have scenario described below and would truly appreciate your suggestion. configured hybrid successfully (Only haven’t configure OAuth). Every hybrid feature is working, but I CAN NOT create MRS End points(webmail.domain.com) to move mailboxes. Also tried this: created Public DNS records for each hybrid servers, FQDN of each server pointed to public IP and internal server responding with same public IP but still can’t create end point using FQDN of servers. It’s difficult to troubleshoot remotely, but I would try with only one hybrid server, just to rule out any issues with WNLB. If this works, you can start adding the 2nd server again and see what’s happening. goo article but i have question regarding the separate hybrid namespace. I’ve set mine up that way but i have been getting mixed results about the virtual directories on the hybrids. Are you saying leave them the way they are which is pointing to the existing exchange servers? So when installing exchange 2010 with different fqdn do you mean when installing the new exchange 2010 server on the internet facing CAS tab. Add a different fqdn there, then in the existing environment after installation change the webmail, outlook anywhere,ews, ecp, active sync external url’s to the names that the pre-existing exchange 2010 servers are using? Thanks for the quick response. Ok, so I’m installing a new exchange 2010 server into the existing environment (eg. mail.contoso.com) and just adding a different DNS “A” record and IP address (eg. o365.contoso.com) to use for mailbox migrations to Office 365. As I understand, when you have two exchange servers (2010 and 2013) ,you can setup the azure connect to the 2013 exchange server. Is it allowed to also migrate the 2010 server true the 2013 server? Azure AD Connect is a separate server (service), independent of the Exchange server. When it comes to migrating, I assume you’re talking about hybrid? You can build a hybrid solution on Exchange 2010 using the new Hybrid Configuration Wizard, no need to install a separate Exchange 2013 server. If you have an Exchange 2010/2013 coexistence scenario, all access will be through the Exchange 2013 servers, including migration traffic. The New FQDN hybird.domain.com only apply for communicate to exchange online and it is a must FQDN for this design? For normal design , we can use mailbox roles to keep use webmail.contoso.com right? if if i have separate hybrid servers, do i need to run the hcw on each one separately ? I am a bit confused by your remarkt ‘separate hybrid server’. A hybrid server is an Exchange server where you run the HCW, that’s all. You only run the HCW once. Yes, you can have multiple servers communicating with Exchange Online, but these are typically the servers already in use. thanks for the reply, i think i get you, you run the hcw once and select which servers you want to include in the configuration. we have an existing hybrid 2013 server (hybrid.company.com) and would like to add a second one for redundancy. Our mailboxes are on exchange 2010 servers, and our autodiscover record is pointing to hybrid.company.com, just wondering will adding the 2nd hybrid to the mix cause any issues ? I’m currently working with an Exchange 2010 customer, where I’ve configured only the Exchange 2010 servers for hybrid usage. But when you use a separate ‘hybrid server’ with an additional FQDN like hybrid.company.com you can add multiple servers after a load balancer. This works fine. You can also add multiple servers with multiple FQDN’s (hybrid, hybrid1, hybrid2.company.com), primary reason would be to configure multiple endpoints. Can be useful when you have to migrate 10.000 or more mailboxes. ‘you can also add multiple servers with multiple fdqn’s (hybrid, hybrid1…’ how ? i guess i can’t use the hcw to do this ? sorry, still trying to get my head around this ! So Outlook Anywhere is required at the server level and also at the mailbox level with set-casmailbox -MAPIBlockOutlookRpcHttp $false ?